The pesticide naled is used in aerial spraying to combat the local outbreak. 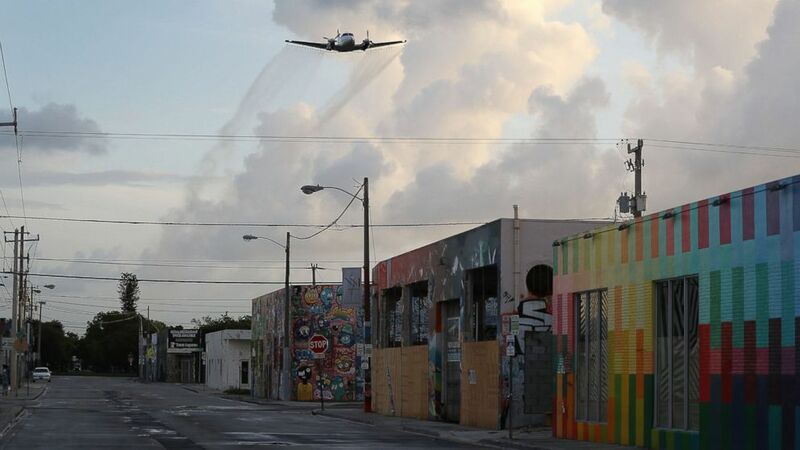 camera (Joe Raedle/Getty Images) A plane sprays pesticide over the Wynwood neighborhood of Miami, FL in the hope of controlling and reducing the number of mosquitos, some of which may be capable of spreading the Zika virus on August 6, 2016. Protesters are raising concern about a pesticide being used to fight the Zika virus in the Miami area, as health officials work to stop the local outbreak. The Zika outbreak in the Miami area has led to 56 infections throughout southern Florida. Health officials have spent weeks using pesticide and larvicide in two areas where they believe ongoing transmission of the disease is occurring. However, the aerial spraying of naled, a historically-used mosquito insecticide, is now under protest by some Florida officials and residents. Miami Beach has postponed spraying in response to public concern, until Friday, according to ABC affiliate WPLG-TV in Miami. Miami Beach City Commissioner Mike Grieco has been leading the vocal protests that led to the postponement, saying that naled is a neurotoxin. "During today's meeting with the city of Miami Beach, city leadership and residents asked for more time to prepare and inform Miami Beach residents and visitors about our aerial-spraying plan," Miami-Dade County Mayor Carlos Gimenez said in a statement after a public meeting on Wednesday, WPLG reported. "In consultation with health experts and the city of Miami Beach, we have agreed to delay aerial spraying with adulticide by one day." This is not the first time that naled, which is usually sprayed from low-flying planes, has been under fire. In Puerto Rico, where the local Zika outbreak has infected thousands, residents protested the pesticide and eventually the governor of Puerto Rico decided not to allow the use of the chemical on the island. Here's a look at the controversial pesticide. Naled is from a class of insecticide called organophosphates, registered by the U.S. Environmental Protection Agency to kill insects, including mosquitoes. The chemical interferes with the nervous system of insects, which kills them. When used in aerial spraying, a licensed professional must handle the chemical. Dr. William Schaffner, an infectious disease expert at Vanderbilt University Medical Center, said that compared with other insecticides, naled can be harsh on the environment. "It is more environmentally disruptive than the other pesticides that we use," Schaffner told ABC News, saying that it doesn't biodegrade as quickly as other insecticides. "It's not used in the EU and it's generally used in very restricted circumstances." In Florida the chemical is sprayed from the air using "ultra-low volume (ULV) spray," which results in droplets small enough to stay in the area. The amount of the chemical used is tiny, according to the Miami-Dade County Department of Solid Waste Management. "Roughly 1 ounce, or 2 tablespoons, for an area about the size of a football field," the department said in a statement last month. Why Was it not used before? The insecticide was used in the first outbreak zone in the Miami area, the Wynwood neighborhood, but initially health officials said they didn't anticipate spraying in Miami Beach due to the high-rise towers. However, the continuation of the outbreak and the discovery of three mosquitoes with the Zika virus led health officials to decide to start spraying. Can the Chemical Cause Side Effects? When used properly, naled should not cause health problems for people or pets in the area, according to the CDC and EPA. However, in large doses or if people are sensitive to the chemical, someone exposed to naled "could experience short-term effects such as skin, eye and nose irritation," according to the EPA.